Attention all aspiring Olympic Weightlifters: We will be hosting our second Open Weightlifting Meet at CrossFit Aevitas on Saturday, April 16th! Come to lift, volunteer, or cheer on your friends as they see their hard work in the "nook" pay off on the platform! On Saturday, February 6th, 10 Aevitas Weightlifters met with 4 weightlifters from throughout the Capital Region to compete in the first open Meet at CrossFit Aevitas. Of the 14 lifters who competed, half achieved PRs on the competition platform! Lifters and spectators learned a little bit about the sport of Olympic Weightlifting and the general format and rules of Weightlifting meets. Of course, everyone had a great time to boot! On April 16th, the Aevitas Weightlifters will be at it again! Come to compete, to learn about the sport and our Aevitas Weightlifting Team program, to volunteer, or to just have fun and be inspired! 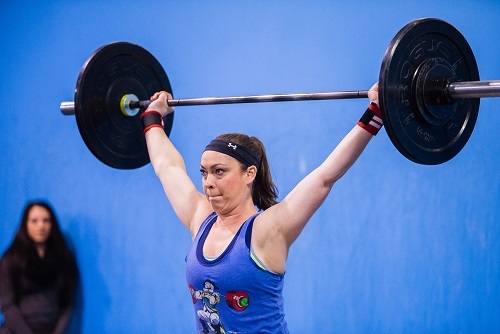 The April meet will be the second open Weightlifting event hosted by CrossFit Aevitas in 2016 that coincides with the Aevitas Weightlifting Team's training cycles. The meet will mark the end of the current cycle and the beginning of the next! Training cycles are building toward the Liberty Games competition this July. This is an open competition to area weightlifters, and is meant to serve as an introduction to the competition format, etc. There will be no prizes for this event as it is meant to be a learning opportunity and a chance to experience competition in a safe and supportive environment. We would love to host any and all Weightlifters who are looking to get a little bit of platform time in, or try something new in a different location! Also, we are open to anyone in the community who would like to help volunteer at the event. No prior experience necessary; we will assign volunteering tasks based on your preferences and our needs. If you would like to attend the Meet as a competitor or volunteer, please message us through our Facebook Page , or email any inquiries to info@crossfitaevitas.com . Please use the Subject line "April Weightlifting Meet" so that your email is directed appropriately. See you on the Platform April 16th!